n the training world, there is constant discussion about what constitutes a learnable, trainable skill and what falls into the realm of motivation or determination. For instance, I can train a sales manager with the knowledge and the skills that can make he or she better at coaching sales representatives. However, I cannot train a sales manager to be motivated to use those skills. Lately, I’ve given a good deal of thought into whether positive thinking is a learnable, trainable skill or whether it relies completely on the motivation of the individual. It’s fair to call any ability that can be enhanced with practice or additional knowledge a learnable skill. By this definition, positive thinking meets the criteria. There are teachable techniques that can help people see the world or themselves in a more positive light. A couple that I have employed successfully over the years are thought stopping and tick-marking. Thought stopping involves mentally or verbally saying, “stop” when a negative or unwanted thought comes to mind. Sometimes the process requires you to say, “stop” mutlitple times to discontinue the negative thinking. This process is most effective when you can replace the negative thought or visualization with one that is positive or healthy. This technique is effective for people battling depression, obsessive thoughts, or addiction. However, anyone can use it in their daily lives. The fact that you are not dealing with a serious mental condition makes it that much more effective. Tick-marking is another way to stop negative thoughts and embark on a positive thinking program. When we are afflicted with negative thinking we often don’t realize how many times during the day we are thinking negative thoughts to ourselves (negative self-talk). For some, there is a constant stream of negative thoughts, self judgements, and critiques of everyone and everything around them. Because we are what we think about all day long, unchecked these thoughts spill out into their lives - their view of the world, their self-esteem, and their interactions with others. Tick-marking is a technique where you have a little note pad with you all day long. Everytime you think a negative thought you make a tick mark on the note pad. Some people find it effective to categorize the negative thoughts. This is an awareness tool. Once they become aware of how many negative thoughts go through their minds in a day, many people become motivated to do something about it. Until there is awareness there cannot be action. So, I come down on the side of those who believe positive thinking is a learned skill. That said, it is very much a commitment too. Developing a positive outlook on life has many of the same characteristics as a diet or an exercise program. Motivated to change - until you see negative or demotivated thinking as a problem in your life, you are not going to commit to change. You must commit yourself to chaning the way you think and react to things. Stay on the program - if you begin an exercise program, you will reap the benefits of it only as long as you continue exercising. If you stop, your muscles will atrophy and your fitness level will drop to previous levels. Replacing negative thinking with a positive outlook works in much the same way. It requires an ongoing commitment and you will see the benefits only for as long as you work at it. If you don’t provide constant positive fuel and apply techniques that work for you, the negative thoughts can return. Face it, we live in society where there is a lot of negativity and fear perpetuated for a number of reasons. If you don’t take charge of your own thinking, it is easy to fall into the societal malaise. Keep the end in mind - when someone goes on a diet they are going to be successful as long as they continue to visualize their life at the goal weight. What happens along the way, often, is the demons of the present take control and steer the person off course. The dieter falls back into old habits and the diet fails. 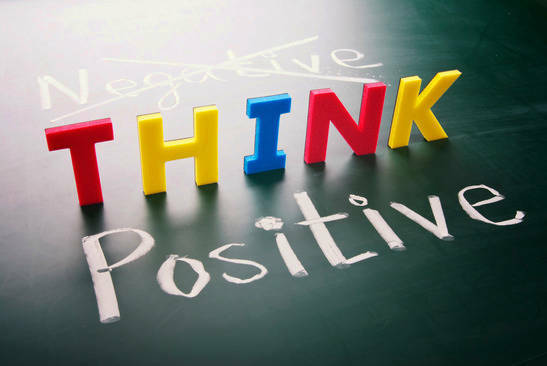 A positive thinking program has the same pitfall. Especially when you are using positive thinking to improve a certain area of your life, it is critical to keep the end result in mind. Your old negative thought patterns are going to rise up and try to get you off course. In fact, the closer you get to your goal, the more intense they may become. The only way through this gauntlet is to keep moving step by step in your new, positive direction. Believe - you have to believe that change is possible. You have to believe that by using affirmations or other positive thinking approaches you can change your life and your mind. Without the belief, the commitment to reach your goal is not going to be there. Accept incremental success - change of any kind in life is a process not an event. Know that you are going to have negative thoughts and doubts. Know that a certain amount of it is just incurable human nature. Commit yourself to keep moving forward and replace those negative thoughts with something positive. Claim your victory - reward your successes along the way and the big win that is your destination. Through hard work and a commitment to see the you and the world that are possible, you can change your outlook from negative to positive. Once you know how all that is left is to do it!